African Americans have shaped many of the most iconic American music styles—gospel, jazz, rock and roll, funk, hip-hop…the list goes on and on. 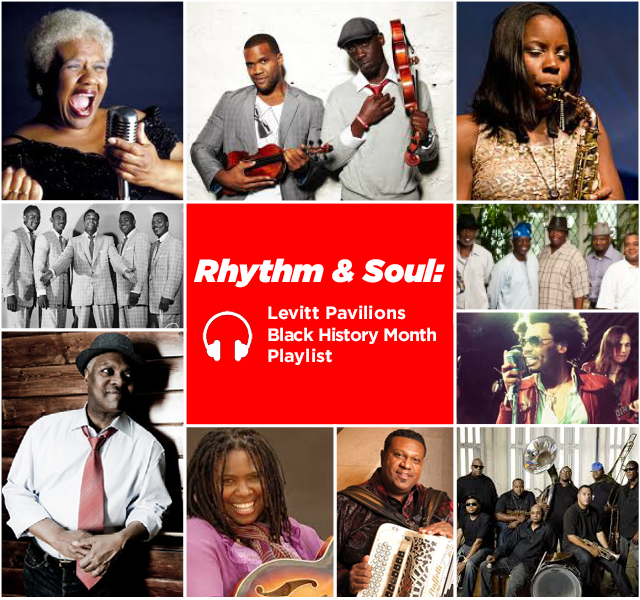 As we wrap up Black History Month, we’d like to celebrate the musical contributions of some of the many talented African American artists who’ve graced Levitt stages across the country. Scroll down to learn more about featured artists! Bell is a passionate soul/R&B singer, a powerful blues/rocker and a mellow acoustic folk/soul singer. While many might recognize Bell’s smoky vocals from his live performances as a contestant on The X-Factor USA (2011), this Seattle-based singer-songwriter has enjoyed a long and prolific musical career. Be sure to check out his Meet the Artist video! This critically-acclaimed, genre-busting duo from South Florida layers strings with hip-hop, classical, rock, R&B and bluegrass. We’re so excited that Black Violin will headline the 2015 Levitt National Tour, bringing their unique musical fusion to Levitt audiences across the country. Stay tuned for more info! This GRAMMY-winning zydeco performer brings Louisiana flavor to the masses. His audiences enjoy high-energy fusions of blues, 70s funk, rock and roll and traditional zydeco. This New Orleans-based seven-man brass band—complete with trumpets, alto sax, tenor sax, sousaphone, drums and guitar—seamlessly incorporates R&B, jazz, funk, Afro-Latin grooves and Caribbean flavor into the traditional New Orleans style, treating audiences to a tasty musical gumbo. These Rock and Roll Hall of Famers are a long-lasting American doo-wop and R&B/soul vocal group. While the collection of vocalists has changed over the years, this group’s iconic gospel infused vocals have remained constant. This Texas-born singer-songwriter has rattled houses of blues and houses of worship with her powerful fusion of rock, blues and soul. In 2010, Foster’s soulful stylings earned her the Contemporary Blues Female Artist of the Year Award at the Blues Music Awards. Fuller is a Colorado-born soulful multi-reed player, composer and jazz educator at Boston’s Berklee College of Music, and she has toured with music industry giants—like Beyoncé and Esperanza Spalding. Whether she’s on flute, alto or soprano saxophone, Fuller plays with a rhythmic freedom rooted in both classical and contemporary sounds. Hailing from Memphis, Luke and his band energize audiences with gospel-infused sounds and rock and roll passion. Their sound captures the spirituality and sensuality found at the core of Memphis soul music. This Memphis-born, three-time GRAMMY winner helped to define the sound of the 60’s. Jones captures the eclectic sounds of Memphis, seamlessly blending soul, jazz, rock and roll and R&B. Be sure to check out his Meet the Artist video! The velvet vocals of this Michigan-born jazz soulstress have made her a jazz and blues legend. Over her long and prolific career she has performed alongside musical greats like Dizzy Gillespie, Ray Charles and Etta James. Barbara Morrison has shattered Levitt records, having performed at Levitt Pasadena a total of eleven times—every year since its inaugural opening. This eight-piece brass ensemble has grown from a local New Orleans sensation to a highly-regarded international talent. This group celebrates the fundamentals of New Orleans jazz, but adds their own contemporary flavor by mixing in R&B, funk and hip-hop. These are just a few of the many talented African American musicians out there who’ve used their art to push boundaries and build bridges among cultures over the years. This month and every month, let’s honor the many cultures that have made the American music landscape as rich and diverse as it is today!